Running a business is challenging and with the right strategies and services, you can keep your business afloat. The Kachina sign center, Tucson offers the best and affordable signage and marker services that will go a long way in business success. Window graphics is popular among business owners especially those in the retail sector. Businesses that use window graphics usually get the upper hand to its competition. Apart from beating competition, window graphics also pass along vital information about your business such as product offers. They are also easy to install, replace and remove. The graphics are great attention grabbers, attracting passersby. With all these benefits, businesses should embrace this form of advertising to increase sales. For most businesses, the task of picking the right designer is a hectic experience particularly considering the quality of services to be offered. However, you can now relax because Kachina sign center is dedicated to catering for your needs. We will create amazing logo designs, use images and text to convey your message on window graphic signs. With a determined team of window graphic professionals at your disposal, you can rest assured that the final results meet your needs. We use modern technology and custom printing to produce satisfying end product; window graphics guaranteed to turn heads. From the use of quality materials to incorporating your business colors, your window graphics will be one to admire and last for a long time. We also offer advice and recommendations on the type of vinyl to use if not sure. The most common vinyl is perforated, opaque and transparent. Transparent vinyl is used for businesses such as boutiques and jewelry stores in order to allow advertising the line of clothing and jewels through window shopping. Our experts will create transparent vinyl window graphics that are attractive and visible. Perforated and opaque vinyl is suited for outdoor window graphics due to their quality. In case you want the graphics not to block light from coming in, we recommend using perforated vinyl materials. Before installing any window graphics, it is paramount to check the regulations governing the use of window graphics in your area. We take it upon ourselves to know these regulations so as to install window graphics compliant to the rules and keep our clients from paying fines. Always ensure that your chosen designers or materials do not break any municipal codes and rules. Kachina sign center has taken many window graphic projects, therefore, increasing our team’s experience and skills. We are open to all for installation and consultation. 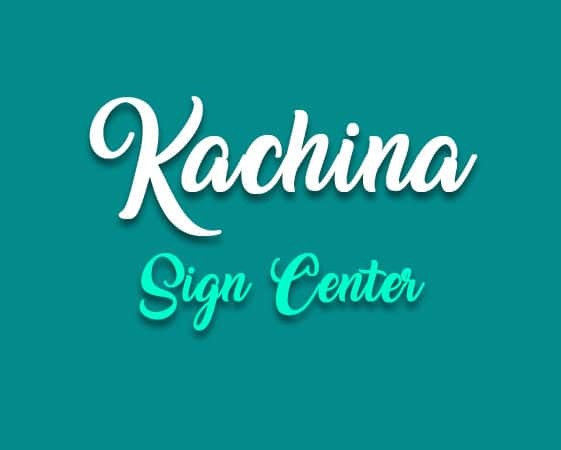 If you need any signage services, welcome to Kachina sign center.